table tent. Plus, I have a thing for roofs. and awning (has dowels in it - I love dowels). which is brown flannel with felt applique. The back of the house has a little round window. and old-fashioned lace curtains with velcro tie-backs. There are window boxes with hidden slots for planting flowers. another little awning to keep the rain out. The shades are down now because it is closed. that's where we'll be a lot this winter. frame. So I slashed away the inner layer and all was well. The fabric for this house was mostly thrifted bedsheets. print stuff doesn't grab me so much. 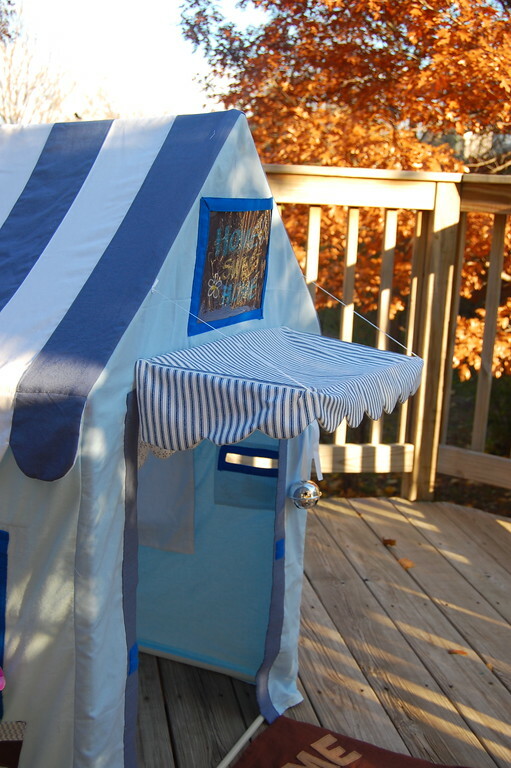 our house: it can be folded up tiny and put away! it cannot be bought at IKEA. which she carried around all day. 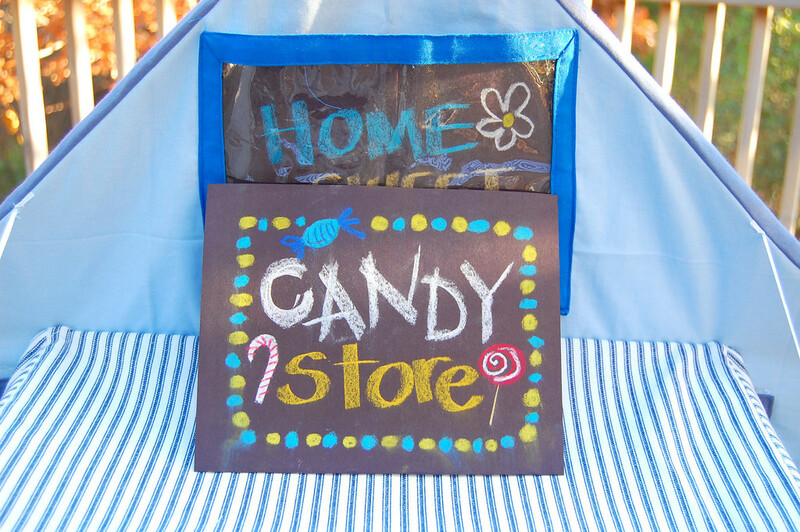 if you're interested in your own candy store for Christmas. And with that, I can honestly say I am done with tents. Unless a really fascinating new shape comes along, that is. OMG!!!!! that is insane! I am so in awe of you!!! 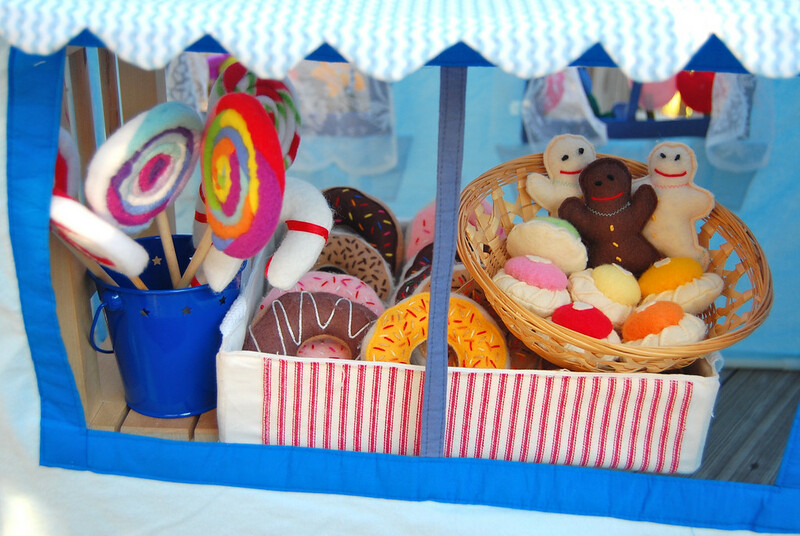 that is my dream, to make one of these, but even in my dream it didnt look as amazing as this!!! This is amazing! What a fantastic idea. 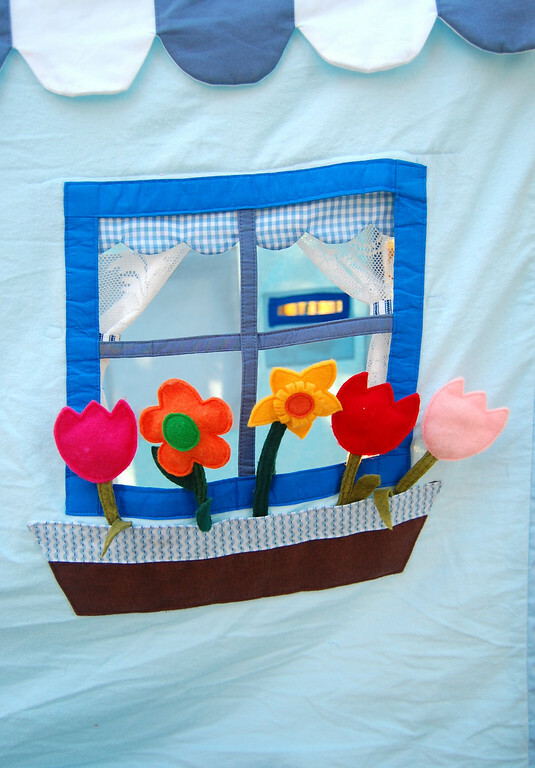 I actually have a frame for a house that my daughter used when she was smaller and the house fabric is torn now - this would be an amazing craft to make for her little brother. I'm not sure I have the courage to do it - great job!! The detail is AMAZING!!! I'm speechless. you are a super mother and sewer! I'm blown away again! The house is adorable and has so many features that I would have loved to have when playing (I espeically love the mailbox, I love getting mail!). Once again...you amaze me!!! Incredible! Wow, I love it. You are sew talented and your girls are the lucky recipiants of your gift. AMAZING!!! Seriously I love this - you are too clever. 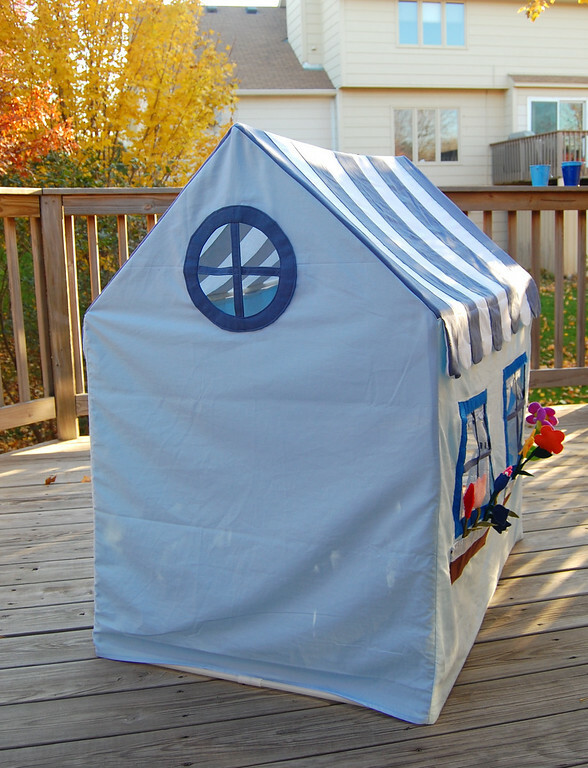 I love your blog, and I love your playhouse! I made one for my oldest son when he was 1, 4 years later his baby brother loves it too. Did the frame myself, PVC pipes are easy to use since you can buy all the different types of joints. Your house puts mine to shame though, it's just wonderful! Incredible!!! You are an amazing creator! 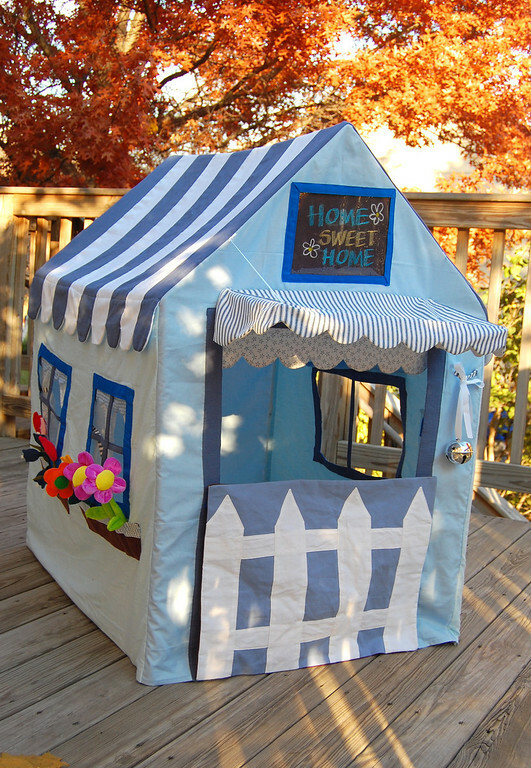 I've been wanting to make a similar playhouse for my girls, and if it is half as amazing as this is I'll be thrilled!! Great job! This is really spectacular. Well done! That is so cute! 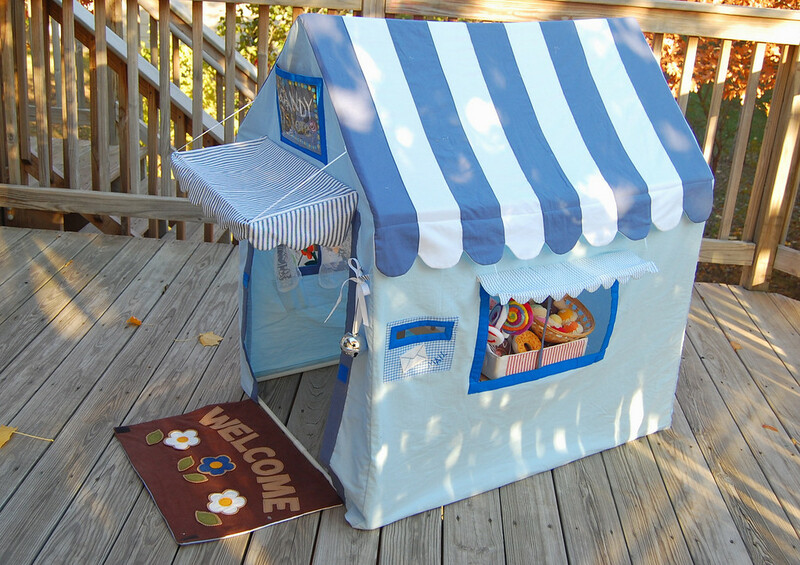 I love that idea...what a perfect little playhouse! Great job! good golly!!! How awesome is that little house! Great job!!! Absolutely amazing! What a fantastic gift to give to your little girl. I absolutely love this little house. Oh my! It's just beautiful. Amazing as always. 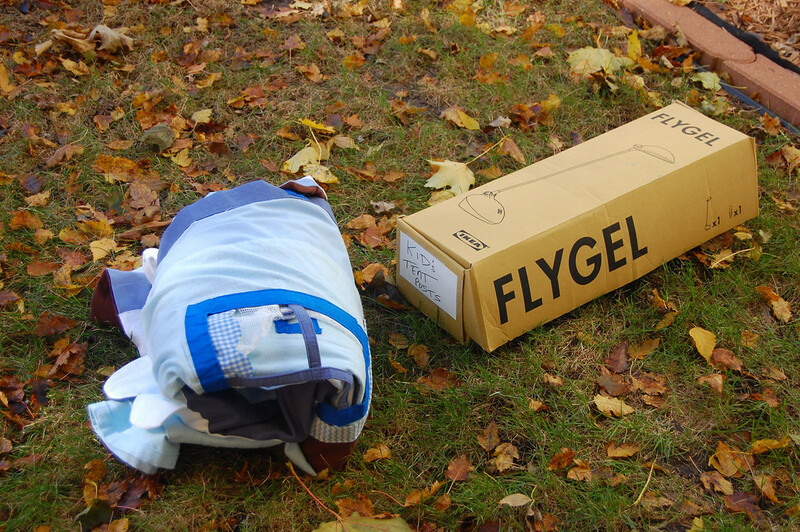 I have this exact frame, it was a bug tent that was for sale at Target a couple of years ago. Now I have visions of a whole new tent for my kiddos. Oh my gosh! 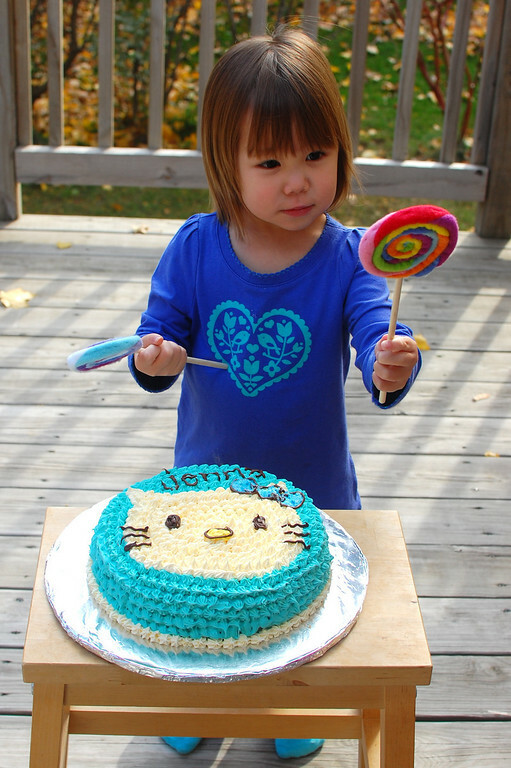 This is what I was planning to make for my girls for christmas (they're 1 and 3yrs old)!! You found the frame at a garage sale?? Lucky duck... do you think it'd be possible to make it with dowels and plumbing fittings? Any tips on the sewing? 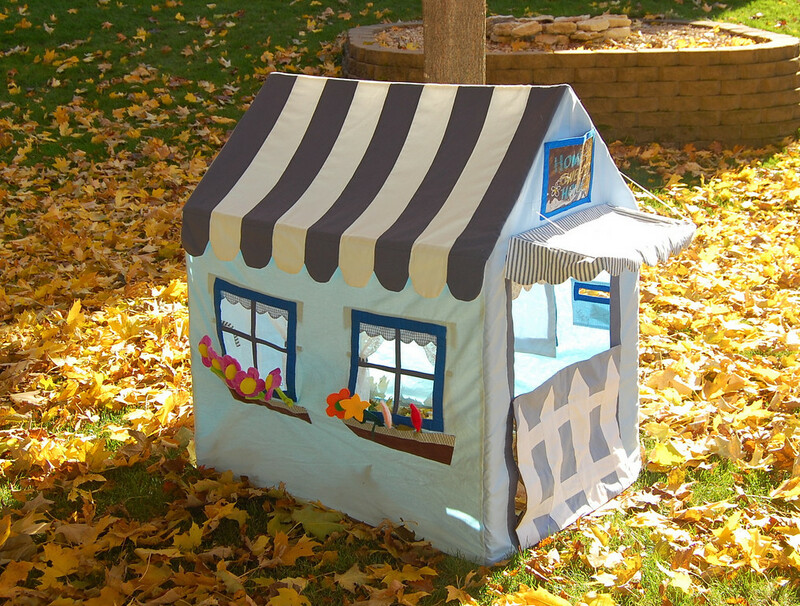 I can't wait to make mine, playhouses are the best when your little. You make the most amazing things! I'm just in awe all the time. Please please please consider writing a book someday with all you fabulous ideas and then sign me up for a pre order. That would be soo cool. Just when it seems like you can't possibly make anything cooler than your last project, you blow the roof off the place with something new and amazing. Well done! I love so much about this little house. 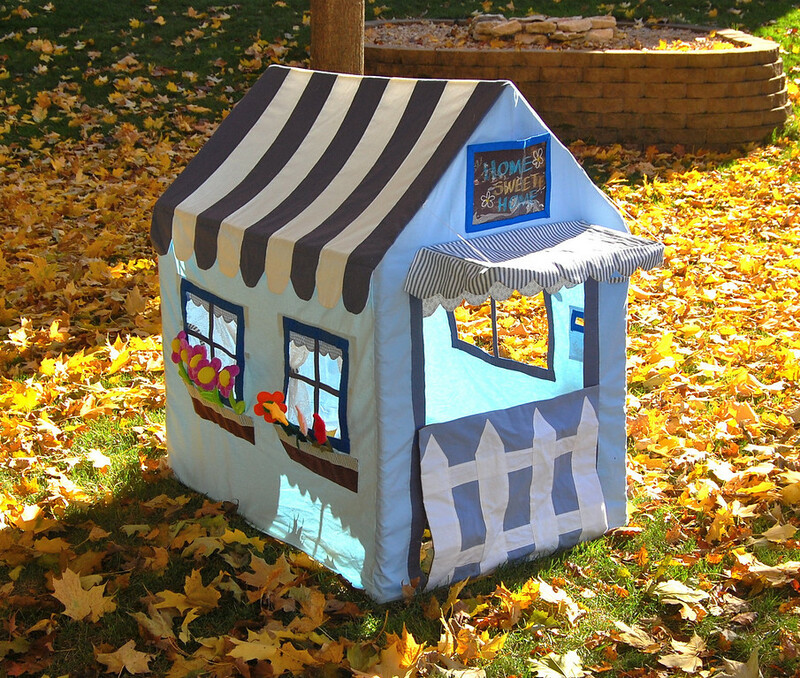 The colours you have going on are gorgeous and the versatility of the whole half door/fence, shop/house etc makes it so much more awesome than just a play house. It's a beautiful heirloom toy! I wish that I had a bit more focus for making things that will last forever and not just stuff made from trash that go back to the recycling bin after a few weeks. 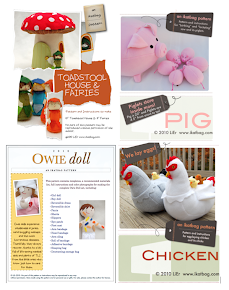 I love seeing your sewing projects! They always make me smile. 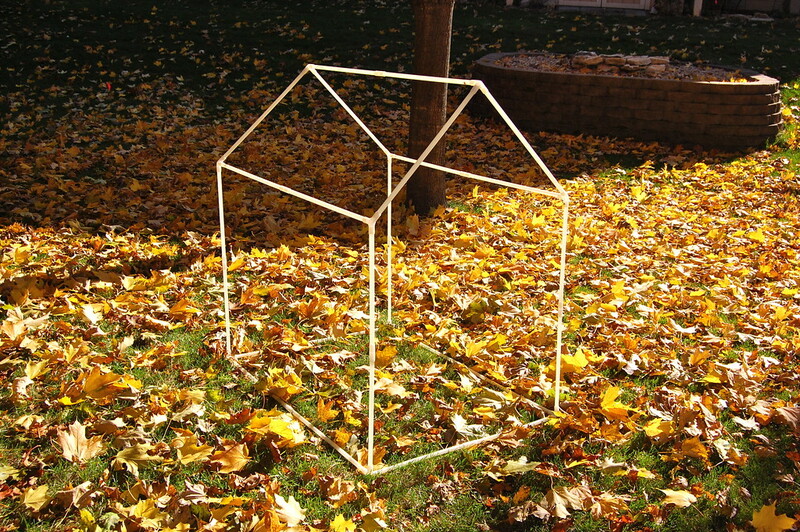 I wanted to make a house shape from plumbing parts just like this one, but wasn't sure where to find parts with the right three joint angles to do the four top corners. Me and my sister used to have a dreadful polyester covered house, but the skeleton for that is long gone. KM: I actually took a protractor and measured the angles. (But could have used geometry to work it out too; I just didn't think). The roof apex is 90 deg and the roof-to-wall angle is 120. I suspect those might be easy joints to buy from the hardware store. That's what I think anyway. I could be totally off here, having not been in Home Depot since last Christmas to buy a tree. okay... 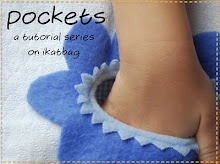 I have to ask for a tutorial OR the very least the measurements that you used for each of the pieces... I have the guts to the house and have been dreading pulling out the original house cover and measuring every little bit... a bit cumbersome when the fabric is still put together. Also, what do you think of putting cross "beams" up with dowels? My problem with these houses is that my 3 kids tend to knock them over easily because they are too rambunctious. I thought when I sewed a new cover that I could incorporate cross beams to help stabilize it. Basically inserting dowels diagnolly (sp?) into a chanell in the fabric. This is incredible! That you for sharing your talent. My husband and I are going to make a playhouse for our kids for Christmas,thanks to your inspiration! Oh my heavens. This is incredible! Your children are very very lucky to have such a talented mama! You know what I love most ... the DOORMAT! AWESOME!!!! So again I thank you. I was looking at the blog the other morning when my 3 year old son plopped down and pointed at this house. Joe want one.... So we are off. I gathered most of my supplies this morning. We happened to have some PVC for a tent downstairs and with a little reworking it now looks like a house that will fit all 3 kiddies. Your ideas are wonderful and you have been keeping me very busy. 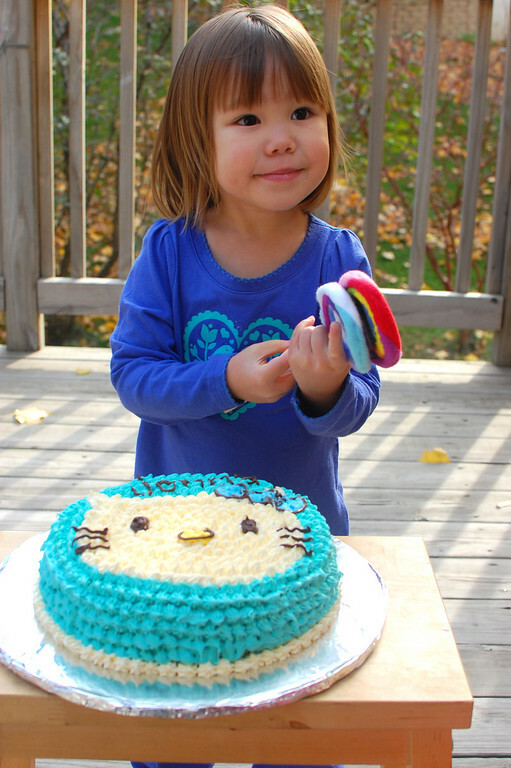 I made a foam cake for a Christmas present, and my owie dolls are in the sewing room waiting to be finished. 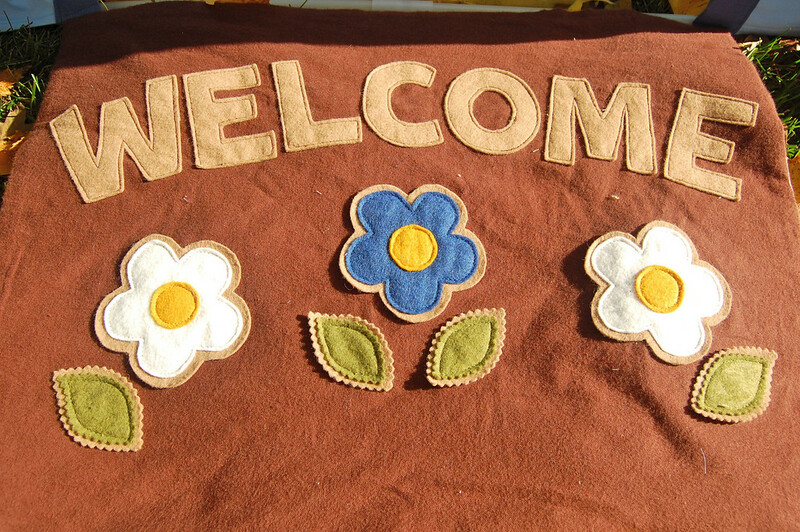 I love to sew and for years I have been quilting, but this is so much more fun. Keep the idea a comin' or it's going to be a long boring winter. P.S. Owie Doll fabric can be found at www.joggles.com, it is called craft velour. I came by when I saw the playhouse on Design Dazzale. So cute! I love it! Cute girl, too! 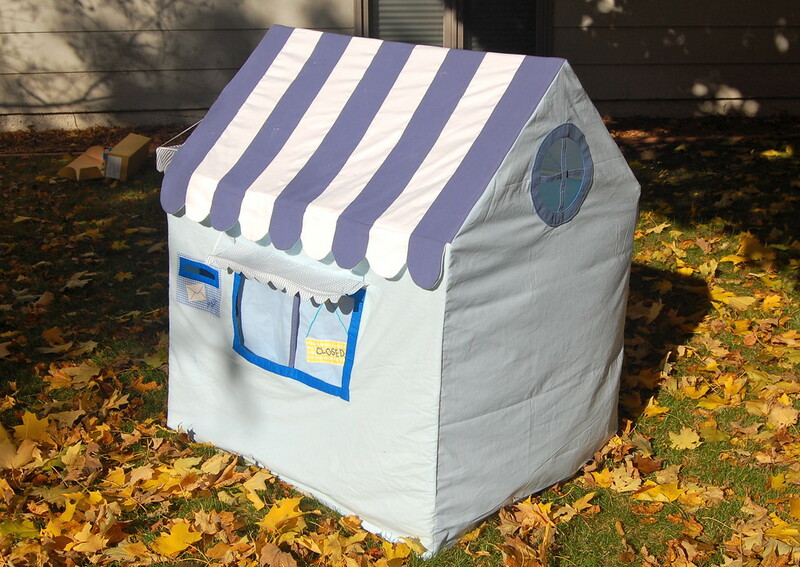 would you ever consider making and selling your tents? 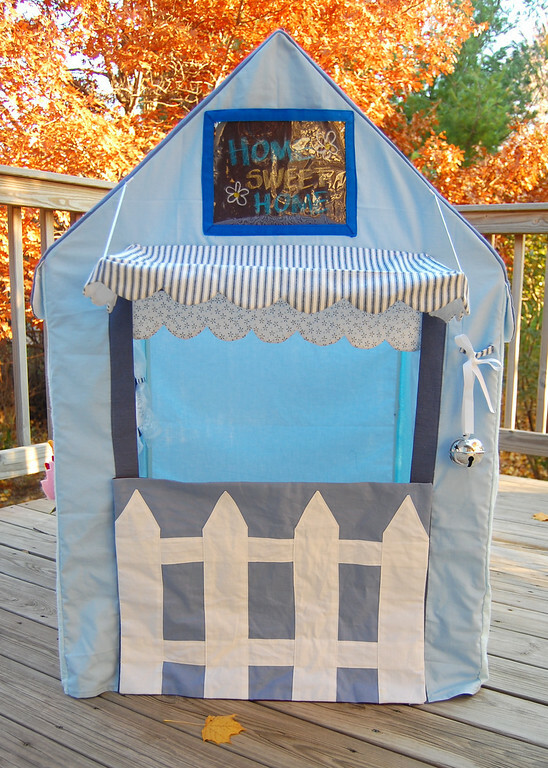 I have a little boy and i was thinking a golf club house would be too cute!!! please let me know. i have two little boys who really loves your play tent ... do u sell the product ... i would like to have a beach house theme play tent .. and how much for that .. u are so talented..
you amaze me....i cant seem to get much done with one almost 2 yr old and here you are doing so much with 3 kids :)....i guess i need to work harder :D. ur kids are very lucky to have such a wonderful mom. 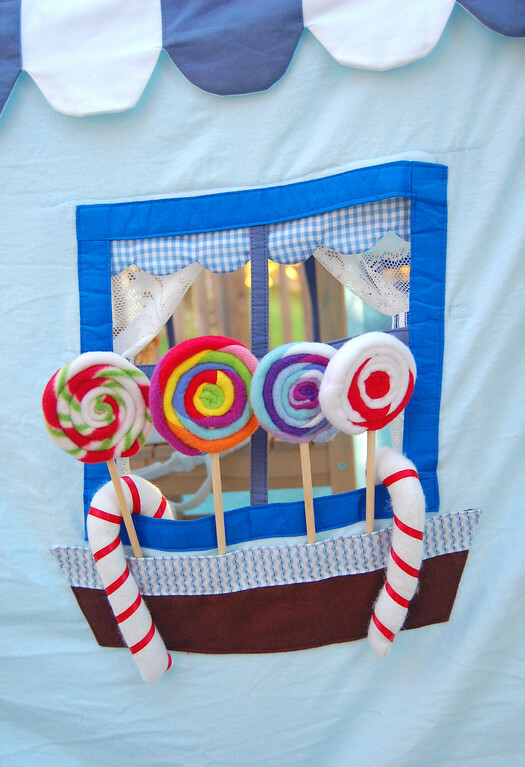 This is another amazing house, and those lollipops are just the cutest thing! This is so amazing! You are so talented! I am trying to figure out how you did the roof. 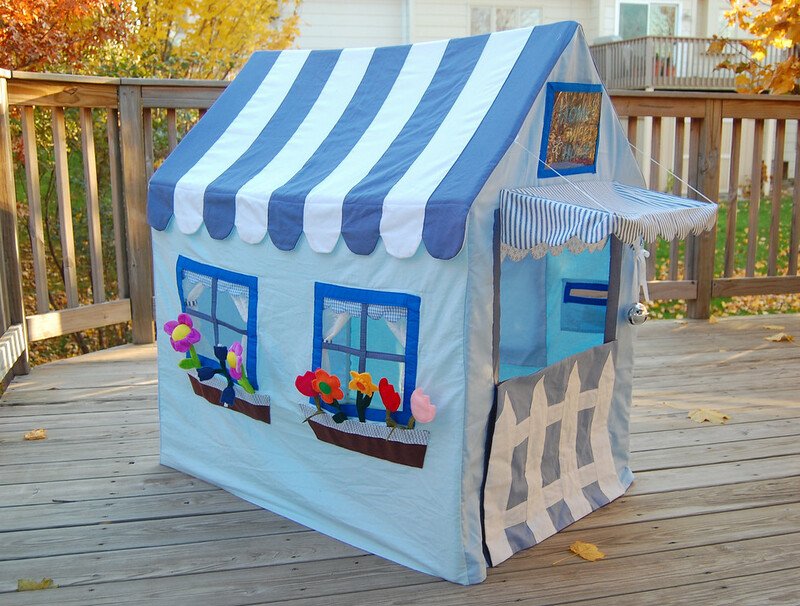 Is the house made entirely of the light blue fabric with the roof sewn, seams finished, on top of it? Or is it more like the table tent you made? The walls are the light blue fabric. 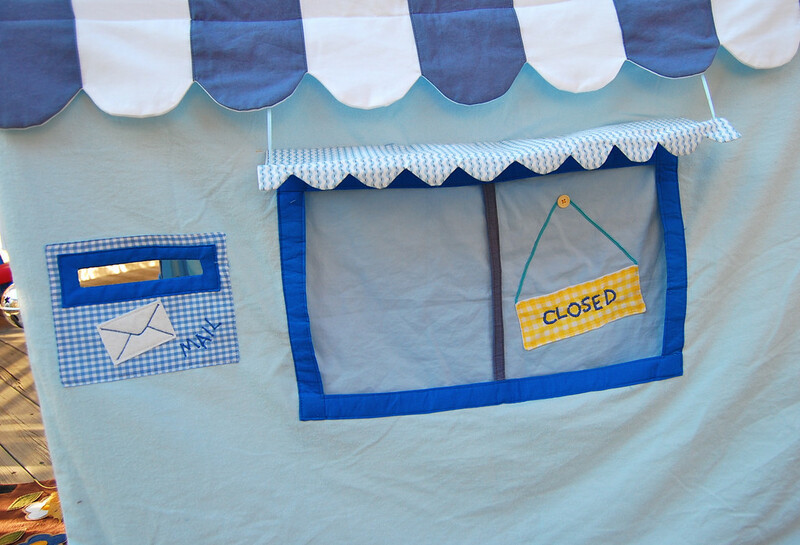 The roof is the dark blue fabric, with white fabric stripes appliqued on. The edges of the roof are sewn to the slanty edges of the front and back walls. So there is no "attic" - a person can stand in the house and have her/his head reach all the way to to the top of the roof. This is AWESOME!! My 2 young(er/est) daughters would absolutely LOVE this!! 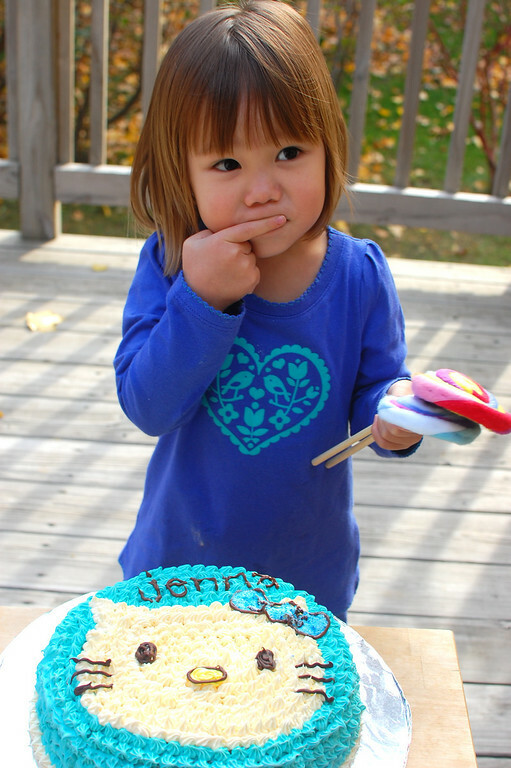 I am going to have to plan to make it for them for Christmas this year. Thank you so much! Darling! 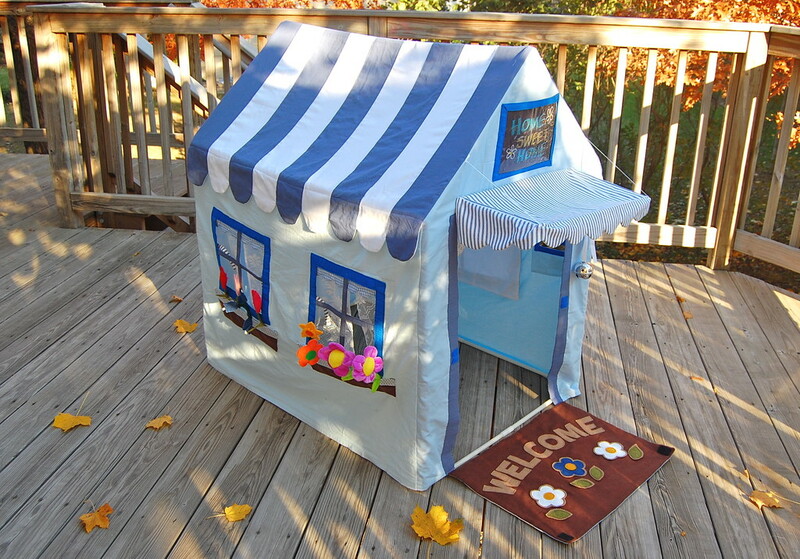 It looks like I'm late to the party, but I'm making something like this for my grandkids and I'm wondering how you made the porch awning and if it is attached to the frame with those cords? Does it raise and lower? Thanks! I'm still trying to figure out the mechanism for raising and lowering that awning.